Which Marketplaces Do You Use? Which ERP System Do You Use? Receive your RFQs in email form like you always have. Even keep the same email accounts. VistaQuote automagically recognizes the RFQs, standardizes them and pushes them to the Cloud so you can access them from anywhere faster! With VistaQuote you will gain insight into staff quoting activity, part and customer trends and gain productivity through automated routing, alerts and auto quoting features. VistaQuote’s smart design allows you to quote multiple RFQs at once and with a spreadsheet like layout, it is fast and easy! And, it integrates with your existing ERP, so no more double entry! VistaQuote recognizes RFQs automatically in your email inbox and reformats the RFQ into a standard, manageable format online. We take all the important elements of the RFQ and make them easy to access with one click. But don't worry the original RFQ email is still available and viewable. With so many listing services, it can be a daunting task to maintain all of those block lists. 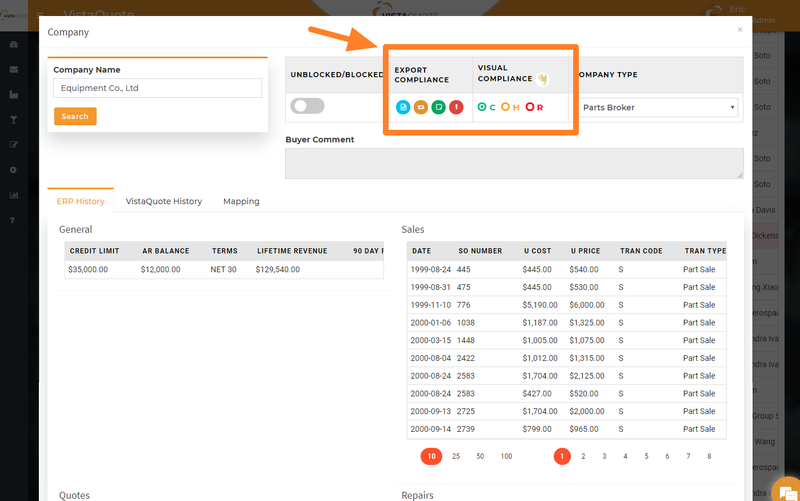 VistaQuote allows you to manage the company block lists in one place, no matter what listing service the RFQ comes in on. Similar to email rules, you can route (or assign) an RFQ to specific employees. These routing rules can be triggered by Company name, domain name, country, parts, and many other data elements. These RFQs will appear in "My RFQs" for immediate action. Identify the critical RFQs by creating Low, Medium and High priority alerts that highlight the RFQs that are most important to you. Alerts can be triggered based on company type, part number, country, listing service, company name and more. Managers, supervisors or co-workers can have visibility into other employee's RFQ activity. This allows for coverage of another employee's assigned RFQs while they out of the office, or perhaps a Supervisor wants to see the activity of one of the employees. Easily switch between employee activity with a single click of a button. VistaQuote has powerful search and filter functions that make your job easier. Part numbers, companies, RFQ numbers and more allow you to refine the RFQ lists in order to manage the workload easier and faster. Sortable grids enhance the functionality too while enabling you to group like RFQs together for a faster response. With VistaQuote's ERP integration capability, you can link your existing ERP system to VistaQuote. This will allow you to view historical data from your ERP system on Part Numbers and Companies right in the VistaQuote Screens. What's more is when you create a quote in VistaQuote, it can insert it directly into your ERP System. No more double entry! With VistaQuote, we don't try to force you to create your quotes in our system. You have the flexibility to quote however you wish. You can quote through the listing service, or by replying to the RFQ through the integrated Email Client. Perhaps you manually enter the Quote into your ERP system or you might prefer to quote directly through VistaQuote. We leave the choice up to you. Powerful, informative reporting and analytics are available in VistaQuote. Gain insights in part RFQ trends, company history or employee response activities. VistaQuote's unique position within the information supply chain allows you the visibility into the data like you have never had before. The logical, common sense layout of VistaQuote lends itself to fast and effective RFQ management. Now, you fill in multiple RFQs and respond to all them at once. Or, consolidate multiple RFQs from the same requestor and respond with a single quote. Streamline your quoting and gain efficiencies like never before! Manage employee's access and ability to perform different functions within VistaQuote through integrated User Security. This straightforward feature set allows you to control who has access to critical functions that are designed to streamline your processes. With VistaQuote you can create automated no quote responses for specific companies, blocked companies or specific parts. More advanced features of Automated Quoting allow you to establish your office's operating hours and then automatically send quotes out for specific parts. Just create the rule for the part, specify the price and condition and VistaQuote will respond for you! 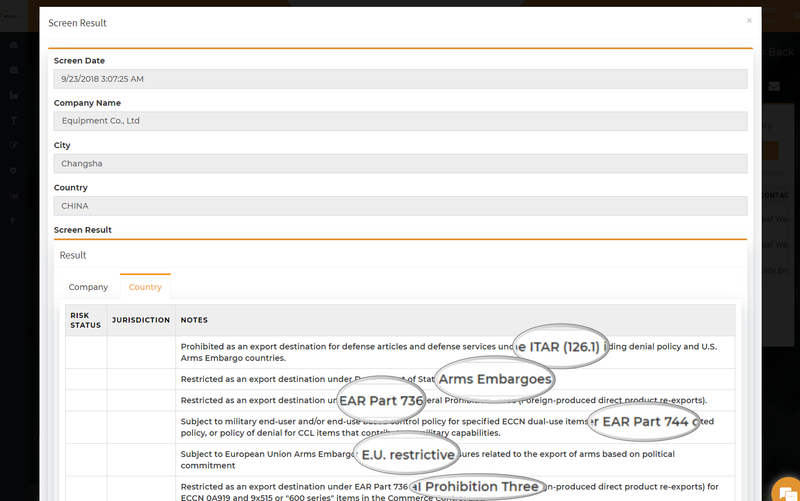 With this feature enabled, VistaQuote will automatically perform export compliance screenings on all incoming RFQs. Screening at the RFQ level means that you can determine if a company is appropriate for quoting before investing further time and attention. We partner with Visual Compliance to establish a robust real-time Denied Party Screening, OFAC, Trade, and Export Compliance solution. Visual Compliance has more than 35 years of experience developing, providing and supporting world-class OFAC, trade and export compliance solutions. This feature requires a separate Visual Compliance subscription. VistaQuote users enjoy substantially reduced Visual Compliance subscription dues. “The main advantage is how much time it saves you entering quotes..All you really have to enter is pricing. Automated restricted party screening is now available in VistaQuote! Ambry Hill teams up with the industry leader, MSR eCustoms to offer the available industry the first ever pro-active export compliance screening system. We are #4756 at MRO Americas 2019! VistaQuote is an Ambry Hill Technologies LLC product. Our goal is to provide you with real solutions to every day problems in your business. Sign up today and see the difference our products can make in your work day. Copyrights © All Rights Reserved by Ambry Hill Technologies.